“Presented the 12 worktrends to the Chamber of Deputies. The trend declined in the excellence of made in Italy. That's why the tradition really can "speed up" innovation. The new Italian startups have centuries of history. And are far from GiantsHi-Tech and the unicorns especially concentrated global in specific areas of the planet, from Silicon Valley Americana to Israeli skyscrapers of Tel Aviv. The new Italian startups in practice they sink their business knowledge, the competence, into the secrets that have been handed down from generation to generation. more. The new Italian startups know contaminate tradition with theinnovation, trying to do something that has always made the Italy excellence: engage ideas, insights "wow" with the capability of doing business in the various areas, in what were once "districts do" and that today they change skin, becoming reticulated, connected, Glocal. These new Italian startups are small and medium-sized enterprises, reality of manufacturing fabric, expression of widespread interest and turnover scale handicrafts and that positions us to every corner of the world. Twenty-five of them have been protagonists in the Chamber of deputies of the new Wwworkers Generation Camp 2017, all about worktrends, or tomorrow's job trends. In fact declined already in doing business today. The new Italian startups leave their mark, an unmistakable signature. 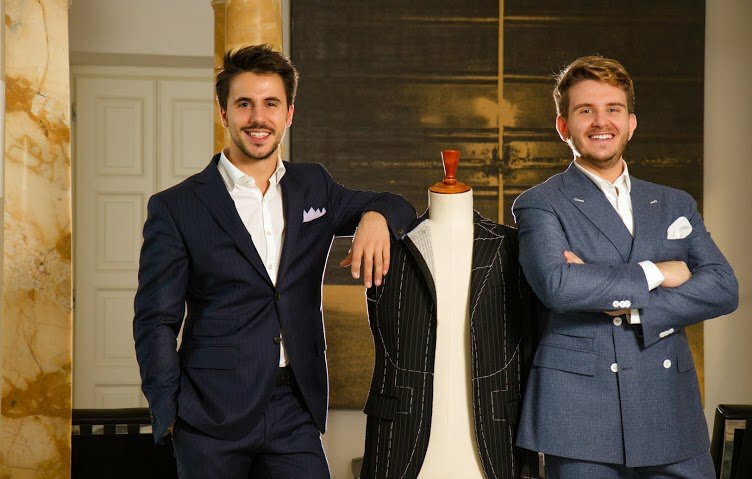 This is the story of two young engineers with a MBA who invented the first e-commerce Italian men's clothing tailored. The beauty of tailoring and the exponential power of the network: This is Jerry M and Ricardo Saez. Technology and production completely made in Italy: "We use only the best lane historical market provided by producers of excellence", precise Saez, thirty of Vicenza. As the lanificio in Biella Successori Reda: strong of the century and a half of history has chosen to experience the potential of new technologies. The setting is unique in its kind in Italy: on Lanieri.com You can configure your own customized garment, and you can decide to touch fabrics and place your order offline in workshop or temporary shop in Milan, Roma, Turin, Bologna and shortly in Munich and Paris. In 2013 Here comes the first loan of 1,5 millions of euro. Meanwhile in Ferrara there is a startup that is by sewing together the strands of the story broken by madness. Printing in 3D the art scarred. An art to rebuild, because worn out by time or destroyed by man with his wicked actions. As was the case with the Temple of Bel in Palmira, brought back to life thousands of kilometres away with seven long months thanks to a cross-team of architects, graphs, Designer. To give new life to architectural wonders and museums we think Tryeco 2.0, reality of the ferrarese artisan research that declines with new technologies applied to cultural heritage. Their headquarters is in the former barracks of the fire brigade: two hundred square meters of open space with a design part and a laboratory of 3D printers, three already provided and a fourth coming. "We were the first in Italy to have a color 3D printer in 4 colors. And all this way back in 2010 ", points out with pride Martyn F, 41enne di Ferrara, an architecture graduate with a degree of restoration led to the digital enterprise. "We contacted especially being restored architectural scopes, artistic and tourist. We are a technological stand for all Museum Directors, technicians and operators of art because we go to integrate their skills ", says F, in partnership with Mailk, May Tan and Federico Balboni. To her credit the team fares also creates a path for the blind, the construction of cups for Egyptian Museum of Turin and content for interactive applications. The winning recipe of these startups among tradition and innovation is also in the oven of a country and in two generations who have decided to do business together. We are in Bibbiano, land of ten thousand souls in the first colline emiliane and birthplace of parmigiano reggiano. The recipe of this business – even landed in New York, achieving success among the most refined palates – consists of the key element of the Emilia region, parmigiano reggiano 24 months, assembled with olive oil and flour of the territory. "These three simple ingredients are the mixture of our sheets called Parmonie: the elements are combined and baked in the oven, no preservatives or lactose and with important nutritional properties. So parmigiano buy a key more delicate, like a chip ", tells Gabriele Menozzi, 22enne emiliano graduated in international marketing and co-founder of Parmonie. The activity was born following the recipe conceived by Remo Bronzoni, sexagenarian bakers in the country. Company for two years and at zero distance, the oar and Gabriele: the factory is located in their Bibbiano, employs eight people in an area of 1400 square meters, producing 500 pounds per day for an international market . "The machines have been designed by an engineer of the country", precise Gabriele. Here they are the wwworkers generation and startups these days liquids. Because the work is no longer what it once was, Paraphrasing Mark Strand. Or maybe yes. In the sense that the work is to always when betting on research excellence and on those forms of knowledge that are rooted in centuries of history. But now the job is something else, When it gets contaminated with digital technologies. In the words of Seth Godin piece "wow" lives today by human ingenuity and technological innovation and actually get to hybridize the crafts of yesteryear making them more competitive, contemporaries, International. We live in fact years liquid grinding insights of genius with new technologies, years marked by Time Economy, as reportedEconomist on the cover in recent weeks, arguing as the true oil of today's data and especially by their possession. So the work changes paradigms, accelerating transformations, offers new scenarios, enables "global microbrand" to fight the same digital arena of large multinationals and to climb exponentially and within a limited time interest and turnover. And whilst the Guardian last year in the short "The Last Job" Describes the last woman on Earth in a world dominated by robots, There are those who prophesy less apocalyptic scenarios, still in the sign of transformation: for the report Tomorrow Jobs the 65% of students today will tomorrow jobs that do not yet exist, accelerated 3D technologies, immersive vision, instruments related toindustry 4.0, platforms in crowd, big data, connected objects and much more. At the center of this revolution plays a starring role also the manufacturing base represented by micro-enterprises, small and medium-sized enterprises, by craftsmen and professionals more technologically advanced. INDUSTRY 4.0. Humans and Humanoids at work: space for changing work automation, Optimizing scanned worker's time and space. And redefining a company's processes and culture today more associated. INTERNET OF THINGS. Dall'Internet of things to people's Internet, as he wrote the Guardian: connected objects become smart, improving people's quality of life (with an eye to sustainability). E-COMMERCE. Boom for sale online, accelerated by social networks and from the mobile revolution. And if research and production are in Italy, the sale can be anywhere in the world with the marketplace "Glocal". SOCIAL, MOBILE, MULTIMEDIA. From conversations on social networks to social care, the Revolution goes for mobility. And for video: Virtual Reality, Augmented Reality, experiences at 360°. And buying becomes immersive. CROWD & SHARE. Collective intelligence accelerates revolutions in recent years liquids: from Italy ideas on the net to climb thanks to crowdfunding, Crowdsourcing, sharing economy. COWORKING & NETWORKS. New ways and places to work: the integration between online and offline to Coworking. And from physical to virtual, with new formal and informal networks of enterprise and new representations. MILLENNIALS & SILVER. Surf between tradition and innovation also means contamination. And the enterprise hybrid mix between cultures and experiences. New business locations with alliances between silver and Millennials. DIGITAL MANUFACTURING. Crafts squared thanks to digital. The world's leading manufacturing Italy tries new paths digitalizzandosi: Thanks to 3D printing and production and to an idea of customizing the hi-tech service. SEARCH, PATENTS, SKILLS. Innovation equal research. But also intellectual property protection and exploitation of patents. In a world dominated by technology knowledge become an enabling force, economic capital, In addition to human. BIG DATA. Individual and aggregate data, complex data. And man at the Center. From the data scientist at IoT manager: In addition the algorithms new professions linked to the world of innovation. NEW PAYMENT. The cash of the future goes through your smartphone. But it also becomes more, Thanks to complementary currencies, alternatives, hybrid payment systems. The revolution of startups fintech.